Cold and snow on the way. with storm team 3 meteorologist brandon libby for a check of today's weather forecast... (((weather at wall((( we will be waking up to brutally cold temperatures this morning with lows for some in the double digits below zero and wind chills around 20 below. frostbite will set in quickly on exposed skin. 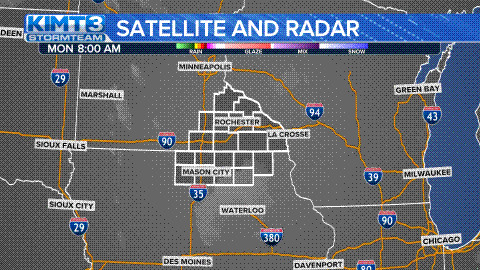 clouds will return quickly this morning with isolated light snow showers possible in southern minnesota. otherwise, it will be windy today with highs only in the lower to mid teens with wind chills likely below zero most of today. isolated snow showers mixing in with freezing drizzle is possible tonight as temperatures rise thanks to a breezy southeast wind. this will make things slippery for tuesday's commute. then heavier snow showers will be possible for late tuesday morning through tuesday evening and night resulting in more accumulating snow, some around 6 inches or more. travel will be poor on tuesday and tuesday night. wednesday looks partly cloudy with highs remaining in the teens. after a snow chance on thursday, temperatures plummet with air temperatures approaching á20 and wind chills much worse. highs look to stay subzero friday with more snow possible in the evening and night. temperatures remain downright dangerous for the weekend. today: isolated light snow north/mostly cloudy/breezy. highs: lower to middle teens. winds: southeast at 15 to 25 mph. gusts near 30 mph. tonight: areas of snow showers and freezing drizzle/breezy/ rising temperatures. lows: middle teens and rising. winds: southeast at 10 to 20 mph. gusts near 30 mph. thanks brandon.